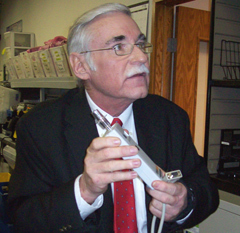 Kevin Doyle shows off an interlock device. The head of a company that makes devices which prevent drivers who are drunk from starting their vehicles says other states have jumped ahead of Iowa when it comes to making sure habitual drunken drivers cannot drive. 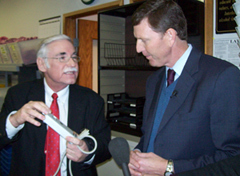 Kevin Doyle is president of Consumer Safety Technology, a business based in Clive that manufactures the “Intoxalock,” a device which requires a driver to blow into a tube to prove they aren’t intoxicated before they can start their vehicle. Doyle cites new laws in other states, including New York, which now require the longterm installation of ignition locks in the vehicles of habitual drunken drivers. Doyle gave Republican gubernatorial candidate Bob Vander Plaats a tour of his suburban Des Moines company earlier this afternoon. Vander Plaats, though, said he isn’t ready to discuss “specifics” on what new drunk driving restrictions he’d propose as governor. Doyle, the owner of the ignition interlock company, is upset about one of Democratic Governor Chet Culver’s item vetoes. But according to a spokeswoman for the Iowa Department of Transportation, Culver used his item veto power on the bill because it failed to specify where second-offense drunk drivers could drive to if they installed the breath-test interlocks on their vehicles. And, the D.O.T. adopted an emergency rule a few months ago so that second-offense drunk drivers who install the ignition interlocks may only drive to and from work, school or alcohol treatment. The D.O.T. spokeswoman says if the governor hadn’t used his item veto authority, those second-offense drunk drivers could have used their temporary driving privileges to drive anywhere, any time — and could have even driven to and from a bar with their temporary driving permit. Federal officials were also threatening to withhold federal funds if the governor hadn’t item vetoed the provision. Doyle said he disagrees with that interpretation. “The terminology is irrelevant when you look out on the streets and sidewalks and see human blood,” Doyle said.